Samsung pretty much has a monopoly on Tizen, being among the controlling parties interested in this OS, but who knows what the future brings? 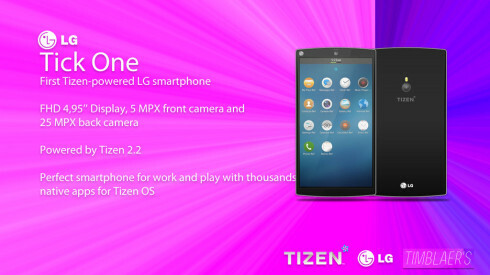 It may even bring a LG Tizen phone, that like rendered below by Deviantart user Timblaer. We’re dealing with the LG Tick One, that draws its inspiration from Nexus 5 and LG G3. The smartphone packs a 4.95 inch Full HD display, a 5 megapixel selfie camera and a 25 megapixel back camera. There’s Tizen OS 2.2 on board and this model is expected to be perfect for work and play with thousands of naive apps for Tizen OS. The interface seems to be pretty clean and I think it’s relatively similar to Ubuntu Touch in some regards. The design is pretty original, in spite of the above mentioned models used as inspiration. Even Samsung is having a hard time launching a Tizen OS phone, so this LG concept phone may be harder to achieve than you imagine. Do you think Tizen really is on its deathbed, as everyone speculates?